This one-hour session will provide information for teachers about Easter and its significance for Christians. We will explore teaching and learning strategies suitable for 5-11 year olds to support you to create a planned programme for learning about Easter for younger and older pupils in the primary school. 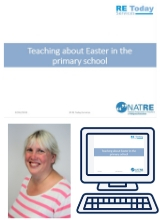 Product includes: hour-long recording of 'Teaching about Easter in the primary school' webinar session recorded in January 2018, copy of session PPT (copyright images have been removed) and associated resources. Any special offers detailed in this webinar were valid at time of recording in January 2018 and are now expired. Includes site license for purchasing school or individual. Product may be used and shared within the purchasing school, but not shared elsewhere. If you wish to purchase this product for use across multiple sites, schools, academies (for example, across a whole MAT) please contact us on sales@retoday.org.uk or 0121 458 3313. "Lots of practical advice and approachable and friendly presenter"
"The resources and ideas that were given to us were brilliant." "I liked the presenter, Fiona, very easy to listen to! I liked the resources and how easy it all flowed together."